New York Street Guide and Transportation Directory. An excellent little 1943 street guide map of Manhattan and the Bronx, New York City. The map covers the boroughs of Manhattan and the Bronx. In Manhattan, it covers from Inwood Hill Park south to Battery Park; and in the Bronx, from the Bronx River Parkway as far east as City Island. Also marks Ward's Island, Welfare Island, Riker's Island and the North and South Brother Islands. The lower right quadrant contains a list of street names. At the time this map was published, New York had earned the reputation of being the most urbanized city in the world. As the world's first megalopolis, New York witnessed large scale development in its infrastructure even during the Depression era. In fact, some of the New York's tallest skyscrapers and art deco buildings were built during this period. 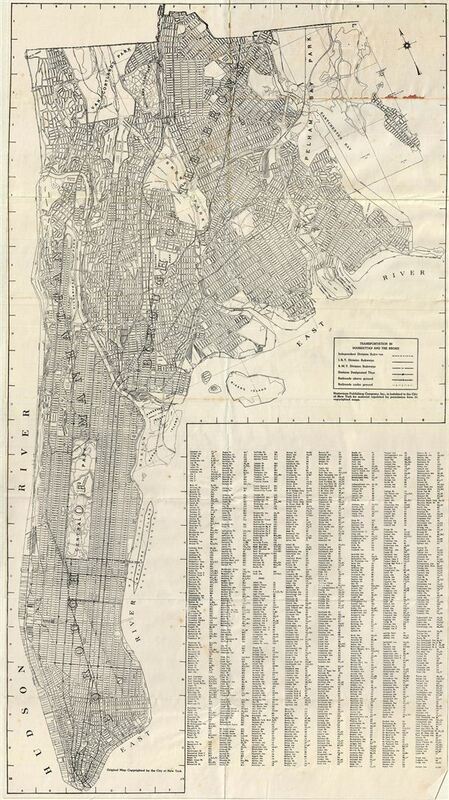 Compiled and copyrighted 1943 by Nesterman Publishing Co. Inc., New York City, this map is reprinted an earlier map copyrighted by the City of New York. Very good. Blank on verso. Some damage near fold lines on top right quadrant of map. Original foldlines.